I know the 1924 Club doesn't begin until tomorrow but I couldn't resist a poem from a collection published in 1924, especially as this is one of my favourite poems. Buckingham Palace by A A Milne is from the collection, When We Were Very Young &, as A A Milne is one of Simon's favourite authors, I know he won't object. What is it about the line Says Alice at the end of every verse that is so endearing? Maybe it's the idea that everything Alice says must be right, to Christopher Robin at least. It's that complete trust that a child feels for a loved adult. 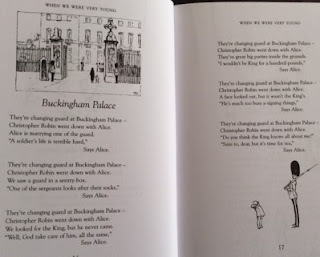 The King's Breakfast is another favourite poem from this collection. I've been reading John Buchan & Baroness Orczy for the 1924 Club & I can't wait to see what everyone else has been reading. I've read the Pooh books, of course, and his mystery The Red House Mystery. But I've never read any of Milne's poetry. I like this one. Thanks! I haven't read any of his poetry for ages but seeing this collection on Simon's 1924 list spurred me on. It was a lovely trip down memory lane. 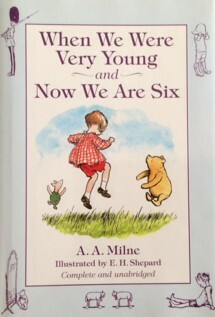 I love AA Milne too. 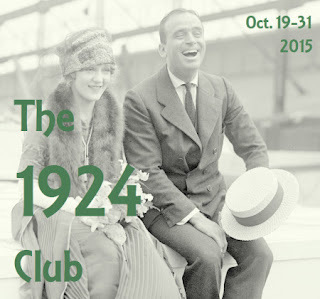 I'm wondering if you've read Buchan's John Macnab for The 1924 Club, I did but I blogged about it last week. I read Three Hostages for 1924. I didn't realise he published two books that year. I still have lots of Buchan to read though, including JN. I received this book as a christening present and this was one of the first poems I memorized as a child. Not quite equal to "The Dormouse and the Doctor" or "Disobedience" (my two favourite AAM children's poems) but always a favourite. I really should read more of Milne's poetry. Like you, I read them all when I was a child but not much since then. I thought you'd be pleased!